Menpehtyre Ramesses I (or Ramses) was the founding pharaoh of ancient Egypt's 19th dynasty. The dates for his short reign are not completely known but the time-line of late 1292–1290 BC is frequently cited as well as 1295–1294 BC. While Ramesses I was the founder of the 19th dynasty, in reality his brief reign marked the transition between the reign of Horemheb who had stabilized Egypt in the late 18th dynasty and the rule of the powerful pharaohs of this dynasty, in particular his son Seti I and grandson Ramesses II, who would bring Egypt up to new heights of imperial power. Pharaoh Ramses I making an offering before Osiris, Allard Pierson Museum. Originally called Pa-ra-mes-su, Ramesses I was of non-royal birth, being born into a noble military family from the Nile delta region, perhaps near the former Hyksos capital of Avaris. He was a son of a troop commander called Seti. 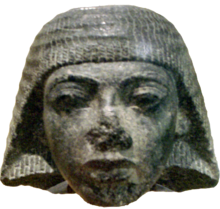 His uncle Khaemwaset, an army officer, married Tamwadjesy, the matron of the Harem of Amun, who was a relative of Huy, the viceroy of Kush, an important state post. This shows the high status of Ramesses' family. Ramesses I found favor with Horemheb, the last pharaoh of the tumultuous Eighteenth dynasty, who appointed the former as his Vizier. Ramesses also served as the High Priest of Set – as such, he would have played an important role in the restoration of the old religion following the Amarna heresy of a generation earlier, under Akhenaten. Horemheb himself had been a nobleman from outside the immediate royal family, who rose through the ranks of the Egyptian army to serve as the royal advisor to Tutankhamun and Ay and, ultimately, Pharaoh. 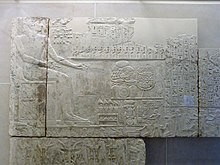 Since Horemheb was childless, he ultimately chose Ramesses to be his heir in the final years of his reign presumably because Ramesses I was both an able administrator and had a son (Seti I) and a grandson (the future Ramesses II) to succeed him and thus avoid any succession difficulties. 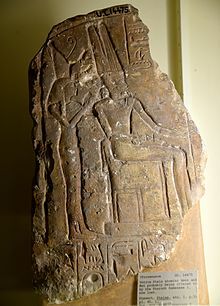 Upon his accession, Ramesses assumed a prenomen, or royal name. When transliterated, the name is mn-pḥty-rʿ, which is usually interpreted as Menpehtyre, meaning "Established by the strength of Ra". However, he is better known by his nomen, or personal name. This is transliterated as rʿ-ms-sw, and is usually realised as Ramessu or Ramesses, meaning 'Ra bore him'. Already an old man when he was crowned, Ramesses appointed his son, the later pharaoh Seti I, to serve as the Crown Prince and chosen successor. Seti was charged with undertaking several military operations during this time–in particular, an attempt to recoup some of Egypt's lost possessions in Syria. Ramesses appears to have taken charge of domestic matters: most memorably, he completed the second pylon at Karnak Temple, begun under Horemheb. "walls, after a hurried coat of plaster, were painted to show the king with his gods, with Osiris allowed a prominent position. The red granite sarcophagus too was painted rather than carved with inscriptions which, due to their hasty preparation, included a number of unfortunate errors." Seti I, his son and successor, later built a small chapel with fine reliefs in memory of his deceased father Ramesses I at Abydos. In 1911, John Pierpont Morgan donated several exquisite reliefs from this chapel to the Metropolitan Museum of Art in New York. 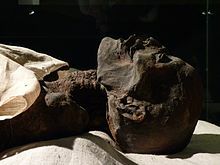 A mummy currently believed to be that of Ramesses I was stolen from Egypt and displayed in a private Canadian museum for many years before being repatriated. The mummy's identity cannot be conclusively determined, but is most likely to be that of Ramesses I based on CT scans, X-rays, skull measurements and radio-carbon dating tests by researchers at Emory University, as well as aesthetic interpretations of family resemblance. Moreover, the mummy's arms were found crossed high across his chest which was a position reserved solely for Egyptian royalty until 600 BC. The mummy had been stolen by the Abu-Rassul family of grave robbers and brought to North America around 1860 by Dr. James Douglas. It was then placed in the Niagara Museum and Daredevil Hall of Fame in Niagara Falls Ontario, Canada. The mummy remained there, its identity unknown, next to other curiosities and so-called freaks of nature for more than 130 years. When the owner of the museum decided to sell his property, Canadian businessman William Jamieson purchased the contents of the museum and, with the help of Canadian Egyptologist Gayle Gibson, identified their great value. In 1999, Jamieson sold the Egyptian artifacts in the collection, including the various mummies, to the Michael C. Carlos Museum at Emory University in Atlanta, Georgia for US $2 million. The mummy was returned to Egypt on October 24, 2003 with full official honors and is on display at the Luxor Museum. The 1956 motion picture The Ten Commandments, directed by Cecil B. DeMille, depicts Rameses I (portrayed by Ian Keith) as the pharaoh who orders the elimination of the first-born of every Hebrew slave family in Egypt, leading to the scenario of future prophet Moses being sheltered by Bithiah, who in the film is said to be the daughter of Rameses I and sister of Seti I. In the 2000 animated musical film Joseph: King of Dreams, by DreamWorks Animation, Ramesses I is depicted as the pharaoh who has his dreams interpreted by Joseph and who appoints Joseph to the office of Vizier when his foresight and administrative skills prevent Egypt from being ruined by famine. ^ a b Clayton, Peter A (2012). Chronicle of the Pharaohs the reign-by-reign record of the rulers and dynasties of ancient Egypt. London: Thames & Hudson. p. 140. ISBN 0500286280. OCLC 869729880. ^ a b Beckerath, Jürgen von; Zabern, Verlag Philipp von (1997). Chronologie des pharaonischen Ägypten : die Zeitbestimmung der ägyptischen Geschichte von der Vorzeit bis 332 v. Chr. Mainz am Rhein. p. 190. ISBN 3805323107. OCLC 932193922. ^ Rice, Michael (1999). Who's Who in Ancient Egypt. Routledge. p. 165. ^ Cruz-Uribe, Eugene (1978). "The Father of Ramses I: OI 11456". Journal of Near Eastern Studies. 37 (3): 237–244. JSTOR 544684. ^ P. Montert, Everyday Life in Egypt in the Days of Ramesses The Great, 1974, p. 197. ^ a b Tyldesley, Joyce (2001). Ramesses: Egypt's greatest pharaoh. Penguin Books. pp. 37–38. ISBN 9780140280975. OCLC 932221233. ^ Brand, Peter J (2000). The monuments of Seti I: epigraphic, historical and art historical analysis. Leiden; Boston; Köln: Brill. pp. 289, 300 and 311. ISBN 9004117709. ^ Grimal, Nicolas-Christophe (1992). A history of ancient Egypt. Oxford, UK; Cambridge, Massachusetts: Blackwell. p. 245. ISBN 0631174729. ^ Ranke, Hermann (1939). "Review of The Temple of Ramesses I at Abydos". Journal of the American Oriental Society. 59 (2): 272–274. doi:10.2307/594071. JSTOR 594071. ^ "U.S. Museum to Return Ramses I Mummy to Egypt". National Geographic. April 30, 2003. Retrieved 2008-04-13. A 3,000-year-old mummy that many scholars believe is ancient Egypt's King Ramses I is the star attraction of an exhibit at the Michael C. Carlos Museum in Atlanta that will run from April 26 to September 14. ^ "Canada's favourite mummy hunter returns". Niagara Falls Review. Archived from the original on 2017-12-04. Retrieved 2017-05-17. ^ "Egypt's 'Ramses' mummy returned". BBC. October 26, 2003. Retrieved 2008-04-13. An ancient Egyptian mummy thought to be that of Pharaoh Ramses I has returned home after more than 140 years in North American museums.